Here’s Part 2 in the series about a crazy previous owner. What is it about 1980s décor that says it should stay forever? At least that’s what crazy former-owner ladies seem to think. My not-so-very-scientific survey includes the woman who sold us her house more than 17 years ago and the crazy lady who finally vacated Tara’s house. How do you answer that gracefully? Last week, when we were stripping blue and white wallpaper (typical of the late 1980s or early 1990s), we were having a good laugh at the really blue tile grout. It wasn’t going to match anything when we were done. I mean really blue. The former owner walked through the destroyed kitchen. Someone asked if she wanted to keep her phone. 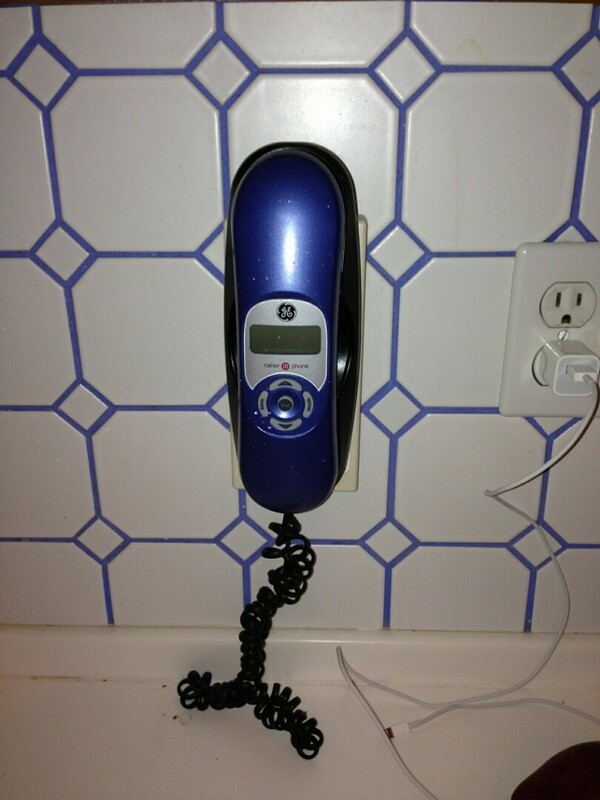 The phone is as really blue as the grout. The stove with the broken gas burners (she always used a match to light the stove) was out, the wall paper was almost completely stripped, the oak-ish cabinets were getting washed and lightly sanded. Previous owner: Oh, I was planning to leave the phone. It matches the kitchen so well. Previous owner: I wish I could find the blue pigment. I repainted the grout every two years or so to keep it such a vibrant blue. I can’t find it though to give it to you. There is nothing wrong with white and blue in a kitchen. It’s a lovely combination. The problem is that Tara picked colors that match her things and her dishes, and that meant the blue grout had to be painted over and the TARDIS blue phone had to go. The previous owner crazy lady was standing in the kitchen that wasn’t hers anymore and telling us how to repaint the grout to match the phone. Photo courtesy of Tara. The walls are painted in her new colors, which don’t include blue. For the record, if we ever sell our house and I meet the new owners at the signing, I will wish them lots of wonderful memories in a home that we loved. I would expect them to paint rooms to match their own personalities, not live in my house—it’d be their house, after all. How would you answer either of the previous owners? Has anyone ever thought you were crazy for redecorating a place that was now yours?